I ‘borrowed’ this recipe from Suzanne Lucques cookbook (a great cookbook, BTW). I lined my serving bowls with raw spinach, roasted new potatoes, orange segments, and sautéed green beans. The salmon I seasoned and put on a pad of butter, and topped with a pad (~ 1/2T.) of butter on a baking dish. I baked at 225F for 25 minutes until luxurious. The tomato topping was Suzanne’s recipe of small grape tomatoes, sautéed in a little olive oil with a diced anchovy until a melty salsa. It was a delicious dish, and easy to make. I’d definitely make again. 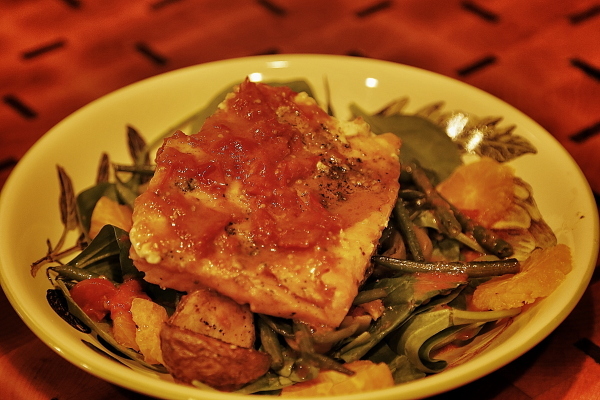 This entry was posted in What's For Dinner and tagged anchovy, salmon, slow cooked, suzanne lucques on December 3, 2014 by kritterspaw.